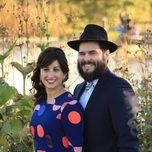 Rabbi Eliezer and Chanie Zalmanov are Co-Directors of Chabad of Northwest Indiana. Congregation Beth Israel is the Conservative synagogue in Northwest Indiana. ​Temple Beth-El is a member of the Union for Reform Judaism. Welcoming to all. Located just a stroll from Lake Michigan and the Indiana Dunes. Members prepare monthly family Shabbat dinners and celebrate together.